The Independent Authority for Fiscal Responsibility organized an international session on Debt Sustainability Analysis. The participants at the event belong to a selected group of high profile economists and experts on the matter. The event is the result of the Authority´s effort to enhance the debate about Public Debt Sustainability amongst different kind of professionals such as policy makers, economic analysts and academic researchers. José Luis Escrivá, President of the Authority, opened the session in which participated a wide range of speakers like Enrique G. Mendoza, Presidential Professor of Economics, at the University of Pennsylvania. Mendoza presented his last research on the Public Debt Crisis of the United States. 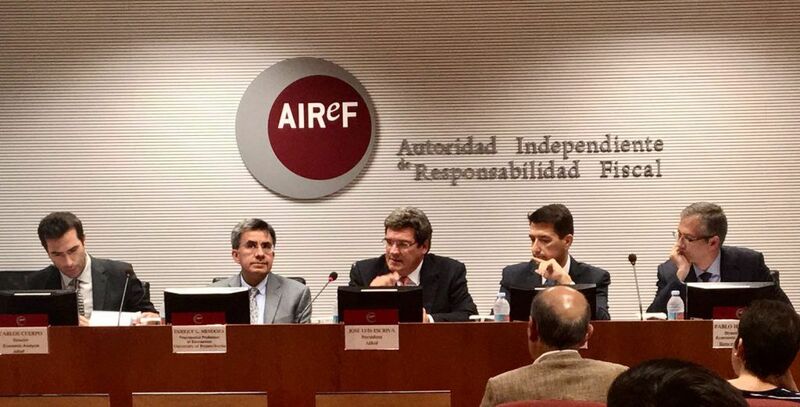 Carlos Cuerpo, Director of Economic Analysis at AIReF, introduced the discussion on the Professors´ presentation. The following speaker, Rafael Doménech, Chief of Macroeconomic Analysis at BBVA Research, exposed a series of lessons from the recession and new options for the future in what concerns to budgetary stability and structural reforms in Spain. To conclude the seminar Pablo Hernández de Cos, Director-General of Economics and Statistics at the Banco de España, was on charge of the discussion concerning Doménech´s exposition.